OhGizmo! Review: The Arizer Air, a Premium Portable Vaporizer | OhGizmo! By Carole Smith on 04/06/16 • Leave a comment! Vaporizers tend to be an extremely popular gadget, with portable vapes being all the rage these days. Today we’ll be reviewing the Arizer Air, which follows in the footsteps of one of the most popular portable vaporizers of all time, the Arizer Solo. The Solo was known for producing outstanding vapor, unrivaled by other portables that were out at the time. It has some downsides though, which include a large glass stem that made the unit less discrete, as well as prone to breaking. What we’re interested to see is if the Air addresses the negatives of the Solo without compromising on vapor quality. We’ll dig into all of this now, but spoiler alert: this thing rocks and lives up to its older brother’s reputation. There is nothing particularly flashy about the Air, but the same can be said of the Solo. Arizer seems to prefer a sleek, simplistic design that allows them to focus on function. The Arizer Air (Assembled in Canada) certainly feels more quality when you compare it to the Ascent Vaporizer (made in China), but it does lack some functionality in comparison. If you care to check out how these two distinctly different portables compare, check out Vapesterdam’s comparison review in which the Air beats the Ascent. The main part of the Air actually appears to be a bit longer/taller than the Solo, but just barely so. Keep in mind that this is not including the glass stems: the stems for the Solo are considerably longer than those for the Air, so in practical terms the Air is still the smaller vaporizer. 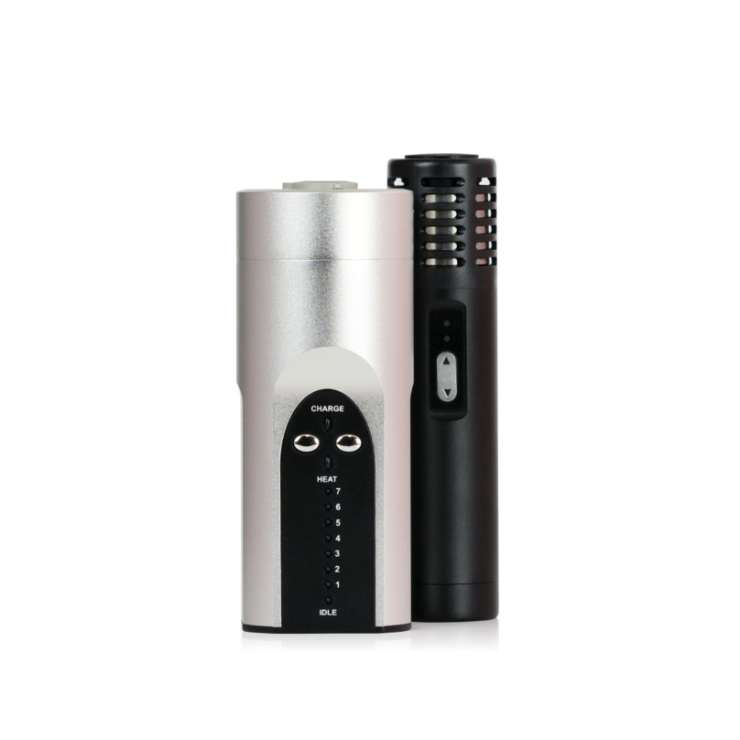 The picture above shows the Arizer Air in the back and the Solo in the front. Inside the box you’ll find two of the glass stems, one a bit longer than the other to accommodate different preferences. The mouthpiece on each is plastic, but the plastic is high quality and does not affect the vapor flavor in any way. There are 5 temperature pre-sets, which give more than enough variability so that everyone can find a comfortable level that they enjoy. Temperature levels are increased by pressing up on the button and are indicated by the color of an LED light above the button. Levels range from 180°C to 210°C. The Air has a ceramic heating element. Heating for the unit is considered to be a blend of both convection and conduction, as hot air is drawn through the material but the surrounding glass gets hot as well. The Air uses Li-Ion batteries with 2150mAh capacity and “IMR” chemistry. These are advanced batteries that are designed to handle the extreme demands of a vaporizer while maintaining consistent performance even towards the end of a charge. Unfortunately in practice the battery life is only about 1 hour. This isn’t terrible, but it would have been nice if the Air could have matched the Solo which can last about a half hour longer. 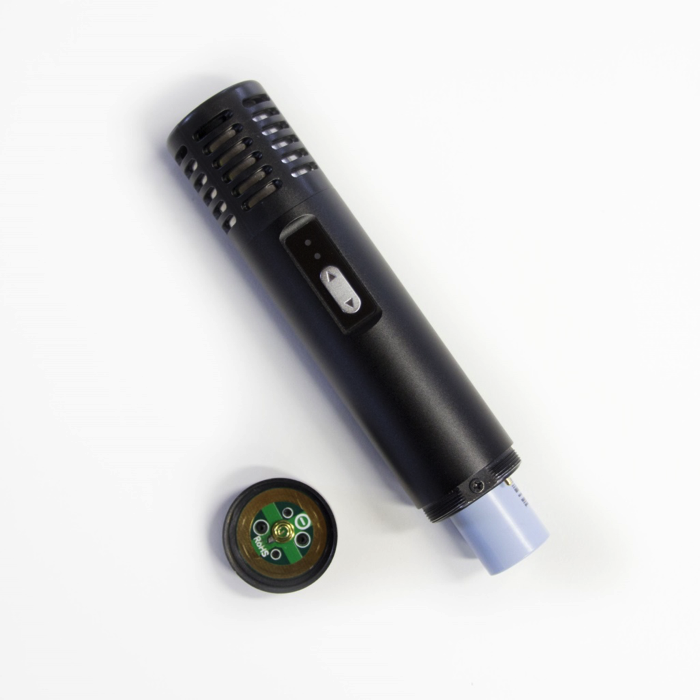 The Air does have an ace up its sleeve, however, as Arizer made swapping batteries in the Air incredibly easy to do. This means that if you find the battery life to be lacking, you can purchase a second to keep charged and ready to be tapped in. Other hardware you’ll find with this unit include a diffuser bowl, a carrying case, a stirring tool, and a clear silicon cover that can be used to improve durability and decrease how hot the unit feels in the hand. We found that the blue preset was a little low to get good vapor, but anything above that should give you noticeable results. It all depends on your own preference for vapor thickness. Once you select a temperature, a second blue LED will begin flashing. When it stops flashing and stays on, the device is ready to start vaping. Herbs are loaded into the bottom of the stem, just like the Solo. So you’re probably all wondering: how’s the vapor? Put simply, it’s amazing. 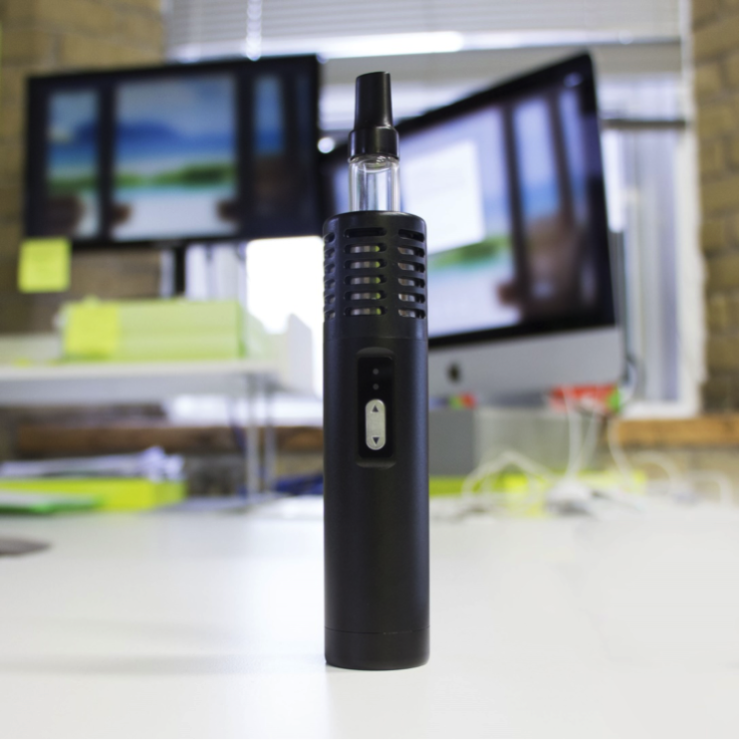 When portable vapes first started coming out, it seemed like they would never be able to compare to their desktop alternatives, but the differences are getting less and less with each new generation. The Air is no exception. We were truly amazed at how good the vapor was. We were worried that the shorter stems may lead to less pleasant vapor in the way of hotter temperatures, but this wasn’t the case. The vapor was everything you could want it to be. Smooth. Flavorful. Light if you wanted it light and thick if you wanted it thick (by changing temp settings). With the other improvements made on the unit, the Air would have been a success if it could have simply matched the Solo’s high bar, but in our opinion the Air manages to set a new mark for other vapes to be compared to. Many people who are interested in portables have stealth in mind too, so we naturally took this out for a spin to see what it was like in a public situation. There are definitely smaller vapes out there, but in our opinion they often heavily sacrifice the overall vapor quality, and the Air was still small enough that we had no problem remaining discreet. The carrying case also made transporting the Air easy and stress-free. Our only complaint performance-wise was the battery life. The device performs very well, but depending on what temperature you vape at, it may only last 3-7 cycles. With battery life constantly improving in most other vapes, this is the one blemish on an otherwise impressive record. If you are in the market for a portable vaporizer, the Arizer Air is an outstanding option that you should be considering. Since its original review by Gizmodo the price has fallen by almost 50% which is typical of how Arizer launches new units and in that light is a pretty good deal now. 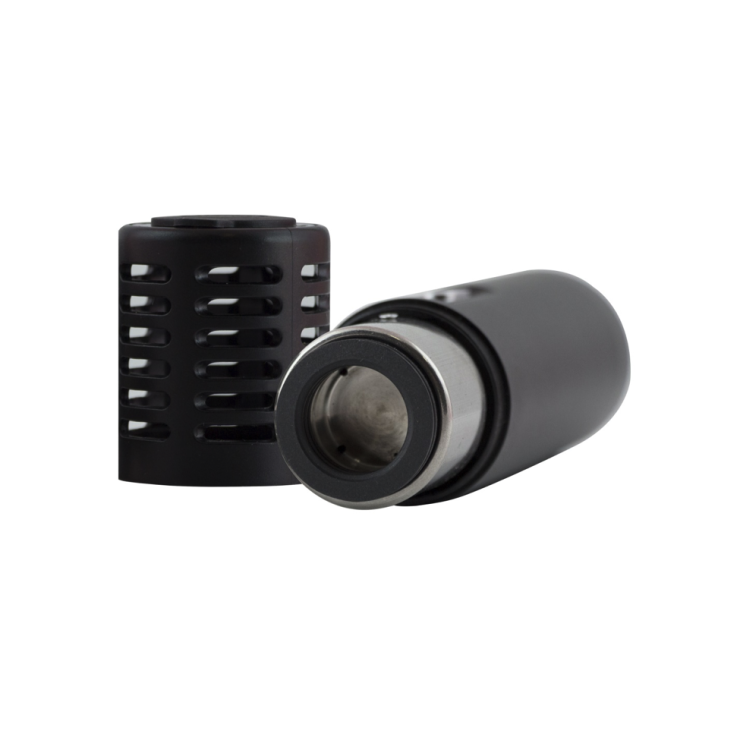 It comes from a well-known and respected manufacturer that has been in the space for a long time, and it manages to build on the already impressive legacy of the Arizer Solo. With an improved design and amazing vapor, we have no doubts that you will fall in love with this vape.